We are sad to announce that Matt is leaving our office at the first of the year, and heading back to school full-time. Thus, we are seeking a Digital and Media Coordinator to support our successful team. The ideal candidate serves as a positive first point of contact for incoming calls, a true team player who communicates clearly and effectively in our fast-paced office. The perfect fit would be someone who knows who we are, and what we do, and therefore we are reaching out to #PRINation to see if you know of anyone who might be qualified and interested in this full-time position. An added bonus (but not a requirement) would be someone who has taken PRI courses, and would be able to assist with some of the clinical/practical application roles in our office, as well as the roles outlined below. Knowledge of how to build/manage Wordpress and other CMS platforms, as well as basic knowledge of Wordpress plugins to maintain day-to-day operations with www.posturalrestoration.com; www.privideoforyou.com; and www.prihomestudy.com. General photo/video shooting and editing knowledge (use of programs similar to Lightroom, iMovie, Premiere). Proficiency in MS Word, Excel, Power Point, and Access, with excellent trouble-shooting abilities. Provide excellent customer service in person, by phone and via email. Accept and appropriately direct incoming calls and email inquiries. Provide assistance with processing PRI product orders, course registrations and home studies. Ability to prioritize directives from multiple individuals while effectively managing several projects. 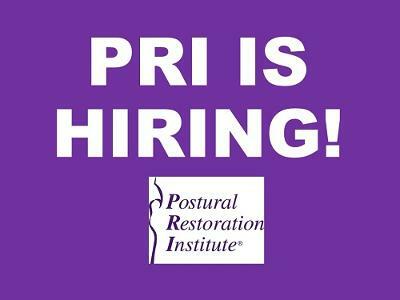 Clinical/practical experience with Postural Restoration® is a plus! If you or someone you know might be interested in this opportunity, please contact Jen. If are unsure whether you fit the qualifications, don’t hesitate to reach out, as we are generally interested in learning more and finding a great fit for our growing office.